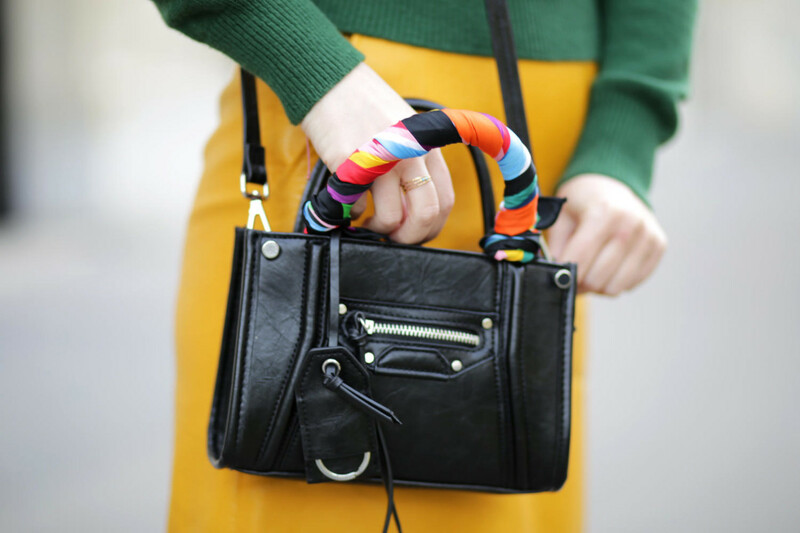 Green and Yellow – Blog Mode Tendance et Lifestyle| Paris Beaauuu! Match 2 strong colors together is never obvious, especially when it’s not summer yet or out of the context of fashion magazines. Still, I enjoy from time to time play with “color block”. Remember this flashy color look, (colors sooo trendy right now) with the yellow that I wear in today, associated with this green jumper adorned with golden eyelet on the sides. To reduce the whole story (of walking incognito in the street, without passing for a traffic light), I put my Prince of Wales jacket in brown tones. As for the accessories, it is basic black, except for the multico scarf around my bag (I already told you about this trend here), which besides dressing the handle of my bag, personalizes and gives a little glimpse’s to my #outfitftheday.